Thanks to Lola the Rescued Cat and Three Chatty Cats for hosting the blog hop. 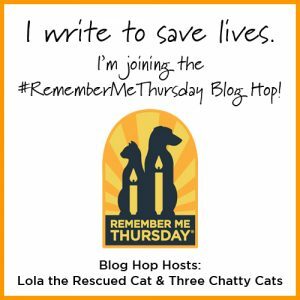 #RememberMeThursday was started in 2013 to shine a light on pets in shelters needing homes. While the numbers are not as bad as they used to be, reports state that almost 3 million adoptable pets lose their lives every year in shelters....just because they can't find a home. These are just the moms of this year - between them they had 16 kittens. We don't know if Cardamom and Delphi have had previous litters...though it is possible. We HAVE to presume that Carling has had many previous litters. Just those numbers alone are scary. Now imagine they hadn't come into rescue. Three of the 16 kittens were girls. Those plus the moms continue to reproduce. Suddenly it goes from scary to staggering. Plus 2 single kittens with no moms - so who knows where they are and if they are going to be spayed. Get involved with a local rescue. If they don't have an onsite clinic, we bet they would love offers to help transport animals back and forth for surgery. Spread the word - you can search "low cost spay" on any search engine or the ASPCA has a searchable database. Try some TNR - there is nothing more satisfying that hearing a door snap shut and knowing that you are helping control the local population. Keep talking about it - spread the word in your town and on social media. Support your local rescue with donations - we bet they have a wish list on their website. We are making a difference....let's keep up the good work. Carling is doing much better being NOT with the kittens. In fact, she would like out of the crate thank-you-very-much (yeah...that isn't going to happen). 1. Keep her completely separate from the other cats in the house and completely dependent on mom. Unfortunately the only place that would be possible would be the bathroom and there are too many places for her to hide or get into trouble. 2. Find a no other cat foster home short term. Unfortunately again, this just isn't possible. Due to a second wave of young kittens, our foster homes are full. Plus they all have pets of their own. Hopefully the little ones can show her that being friendly is a good thing and that will rub off on her. For now mom will keep trying to make friends. Mom mentioned the names to a friend the other day who pointed out that it might be funnier to name the orange/ginger kittens after the Irish beers. Ummm...yep. So, since mom has just started using names anyhow, she switched the oranges and tuxedos. The orange boys are pretty easy to tell apart immediately. The tuxedo boys take a second as their faces are very similar. Peroni and Kiri are by far the friendliest of the kittens. Kilkenny and Sapporo are coming around. Harp and Marzen are playing hard to get for the moment. Carling is actually doing better in the crate. She is much calmer and friendlier. Mom got her in yesterday to the clinic to get her spayed. The clinic thinks she is about 5 years old and she weighed 5.5 pounds. The good news is her life gets better from here. So, for now it is all about spending time with the little kittens and get them friendly and bigger. They are doing pretty well otherwise. The two tiniest - Peroni and Kiri are screamers though which is fairly funny. This is one of those weekends when I wonder if I know what I am doing and if I am doing this right (or should be doing it). A friend had taken Goldfish about a week ago to help me run a social experiment - see if a change of environment would help her adjustment or social skills. She did....OK. However, she is still growling and scared and will not come forward seeking attention. My friend was headed out of town so I ended up picking her back up on Saturday morning. She put herself in a corner and hissed and spit at me and I had to put a towel over her head to catch her again. It's so frustrating. The problem is if we can't get her social, what are her options? I ended up setting up a big crate to see if having her in a limited space would force her to interact. She growled at first and then got flirty with Daiquiri and Chanel. However, things kind of imploded later that night. Carling (the momma cat) figured out how to climb one of the cabinets in the foster room....and escaped. She cornered Chanel and was pretty ornery about it. Thankfully Chanel is so laid back that I was able to grab Carling. The problem is that if Carling could get out, I had to have another solution. She was still be pretty aggressive with the kittens as well. The good news is after 24 hours in the crate, she is MUCH calmer. She does a little growling at Ivy and Daiquiri when they walk by the crate but nothing serious at all. Here is the other problem - Goldfish is now in the foster room with the beer kittens. She isn't being overly polite either....she is considerably bigger and is kind of pushy. On to of that, a couple of the kittens are pretty friendly and the rest are a little jumpy. Having a growly mom and now a growly kitten isn't helping get them friendly. It is just frustrating....I don't have an answer as to what to do about any of them and I don't know what the solution is to "fix" them. I'll move forward and figure it out, but it has been a long couple of days. this little booger went home with his new mom. Concats Annatto!!! The kittens are all pretty friendly. Marzen is a little shyer than the rest. And Miss Peroni took herself on a tour of the condo the other night when mom opened the door to go into the foster room. Just marched down the hall right past Daiquiri and Chanel - tail straight up in the air all self confident. Mom is going to try to remember to break out the scale this weekend to get some weights. She is curious how much the little girl weighs and the differences between the boys. Have a safe weekend and be sure to get in an extra nap. Mom has to be honest here....the momma cat of this crew is giving her heartburn. Momma cat is better than she was Saturday, but still weirdly growly. She finally let the kittens nurse on Sunday. Yesterday when mom was in there she wanted some attention though wasn't seeking it out. She nursed the kittens and even chirped at them to get their attention. Mom left and about 30 minutes later the momma cat was growling at them again. Mom looked at the pet store yesterday when she was cleaning, but the only diffuser they had was for marking, so she is going to have to look around. For now at least she isn't hurting the kittens and is letting them nurse, so we are willing to put up with her weirdness. Plus as mom says, us permanent cats don't seem too concerned about the momma cat's racket in there, so that makes it a little easier. Mom is having problems picking names for this crew too. She thought she had a theme but isn't committed to it. With a mom, 5 boys and 1 girl, it's a little hard. The kittens are fairly friendly. The orange boy with more white and the brown tabby are jumpier than the others, but they are fairly curious and will come over and check mom out. Fortunately we will have them for a while so mom has time to get them all friendly and sweet. Our rescue is up to its eyes in cats, so a flyer went out on Friday about a sale over the weekend. Based on that, mom knew it was time for Annatto to go back. As she was thinking on Friday, she thought about taking Soda back as well. The more mom thought about it, the more she realized that taking him back wasn't freaking her out. So it was a good decision. 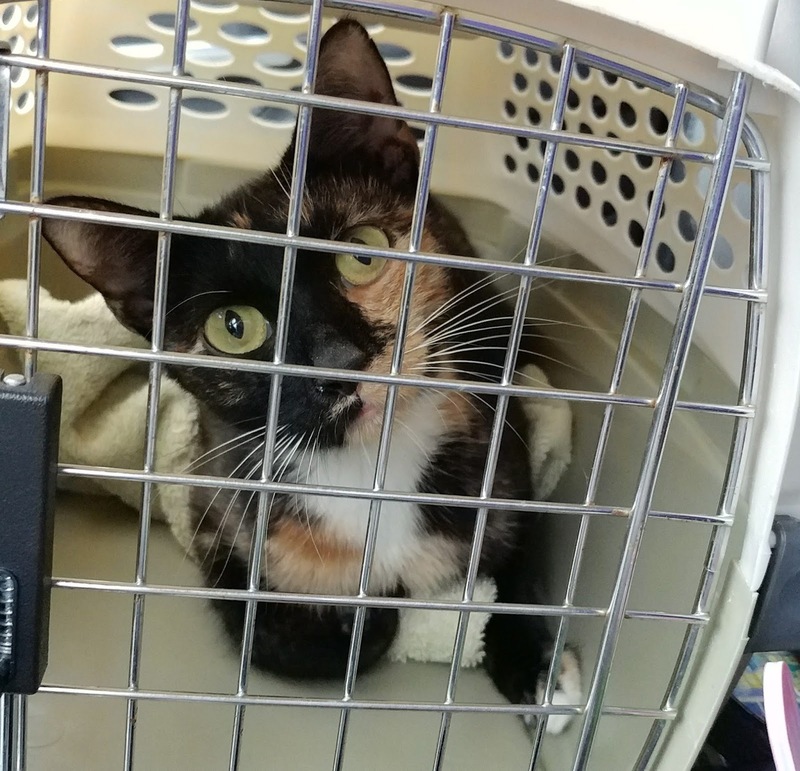 Since the foster room was going to be empty (Goldfish is participating in an experiment to test her social skills), the rescue sent mom home with a mom and 6 kittens that had been left late one night in a carrier outside the rescue. Momma cat is a calico and her tail is about 3/4 length of normal. She is giving off mixed signals and mom isn't sure quite what to do with her. She is very growly and has made some very "pissed off cat" noises and has smacked the kittens. We suspect is is partly hormones and partly lots of change and partly she may be able to smell Soda in the room. By the time we are typing this, the family has been here about 24 hours. The momma cat has settled some, but not much. Though she has calmed down enough to nurse the kittens. Fortunately the kittens are about 5 weeks old so they are eating on their own. Mom did a quick check and it appears we have 5 boys and 1 girl. Mom is going to have to work on a theme for this group. There is 1 brown and white tabby, 2 tuxedos (because of course....hahaha), and 3 orange and white tabbys. The girl is one of the orange tabbys and the smallest of the group. In fact, the others have eyes that have changed from blue but she still has a ring on the outside of her eyes. The kittens are pretty jumpy too but even in 24 hours have come around pretty quickly.